Goodreads Summary: Mara Dyer doesn't think life can get any stranger than waking up in a hospital with no memory of how she got there. This has to be one of the most hyped books of the year, as well as one of the most controversial. Needless to say, I couldn't wait to read it. Once I started it, if I could have read this book straight through, I would have. It's that engrossing, and when I was reading, all I cared about was figuring out the question we've all seen: Who is Mara Dyer? After surviving a horrible accident, Mara wakes up in the hospital with no memories of how she got there. Once her parents tell her that her best friends all died while she survived, she begs to move away. The family moves to Miami, where Mara and her older brother Daniel attend private school. There Mara meets Jamie, the token best friend, and the beautiful and intriguing Noah Shaw. And then strange things start happening. Mara is eager for her memory to return, hoping that she will start to understand everything, but each piece of the puzzle only leaves her more confused. Not only does she have to fight to stay relatively sane, but also she has to fight her growing attraction for Noah, about whom she has been warned. But Noah seems different to her, and he could just be her key to unlocking the mystery surrounding her. 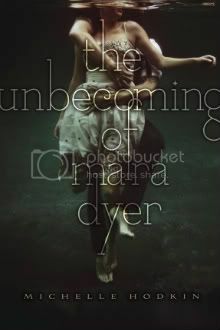 The Unbecoming of Mara Dyer is a perfect blend of mystery and romance, with a dash of the paranormal. But even without the "great mystery," as it were, I think this book would still be incredibly good. Michelle Hodkin definitely has a way with words. The quality of writing and the depth of the story made me forget about everything else. The characters were so intriguing that I didn't mind reading about their day-to-day activities. They each had their own baggage and their own stories to tell, which in some books can be overkill, but here it only made me care about them all more. And Noah Shaw...he is swoon-worthy. It's almost impossible not to fall in love with him. Learning about him was just as exciting as learning about Mara. These are two characters that actually complement each other very well. If you've read other reviews of this book, then what I'm about to say will come as no surprise. About three quarters of the way through the book, things start changing. I'll say it: Things get downright weird. There were times I was confused. My questions weren't answered by the end of the book. BUT. This book is a mystery. It's told in first person, so we only know what Mara knows. Mara doesn't understand everything, so how could we? I definitely wanted more explanations, but I believe that they will come in the next book. In the meantime, I'm going to enjoy speculating what else Michelle has in store for us in this highly inventive, obviously very complex story. This is a book that deserves its hype and then some. The overall mystery is so intricately weaved, and with the addition of unforgettable characters, The Unbecoming of Mara Dyer is a fabulous debut novel. I am already eagerly awaiting the sequel! Romance? - YAY! Mystery - PLEASE! Supernatural? - HECK YEAH! Great review. I'm taking you at your word "it deserves its hype" and will read it asap.